In OUAT’s current Oz journey, Rebecca Mader has been killing it every week as Zelena, our latest villain. It takes a special kind of screen chomping to effectively follow up a line like “This isn’t the wild west” from Regina with “No, dear…It’s the Wicked West.” The fairyback stories we’ve seen on this show can be hit or miss, but thanks to Mader and some effective CGI for once and even a nice ending twist, this Wicked-focused episode is the best OUAT outing we’ve seen in a while. Unfortunately, its starts out on a low note with Neal’s creepy burial, but episode director Mario Van Peebles is clearly trying out some interesting POV camera angles in this scene (with in inter-cut to Zelena and Rumple by his cage), along with some off-kilter hand-held stuff in the scene where Zelena invades Granny’s. As usual, the Storybrookers run around like maniacs, somehow setting up for the showdown between Regina and her half-sister. Belle and the crack Storybrooke’s sheriff’s office even try a half-hearted attempt to free Rumple, to no avail (I actually gasped when the witch revealed herself outside the cage). Things perk up wonderfully once we’re in Oz. Loved the green tornado that drops Zelena into the arms of her foster parents, the nod to the Oz security guards from the 1939 movie, and the reappearance of the original silver slippers from L. Frank Baum’s books, not Judy Garland’s ruby red ones. The entire Emerald City is stunning, one of the show’s best CGI sets yet, as was the reveal at the end of Christopher Gorham’s Walsh behind the silhouette of the Wizard, followed by his immediate transformation into a flying monkey. Welcome back Christopher Gorham, flying monkey! Glad we’re getting more than one episode of you. 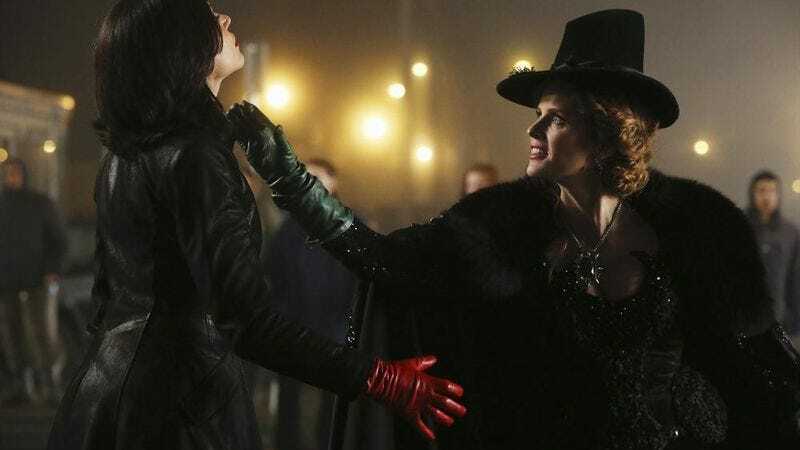 As the Wizard shows Zelena the fate of Regina, her younger half-sister, for the first time, the story of her anguish over Regina’s taking over her birthright begins to make sense, as it’s coupled with her jealousy over Rumple teaching Regina as well. And the fact that he chooses the Evil Queen in the end, because what is Zelena’s only sin? Loving Rumple too much, so much that she even makes him meat pies. He maintains that he’s quite a lady-killer (although I still can’t look straight at his sparkly self with the froggy eyes and horrific teeth, for some reason I find his beaten-down, trapped-in-a-cage persona strangely attractive), so Zelena must let him go. In another nice twist, he finds out after dumping her that her silver shoes could have gotten him to Baelfire in the real world. Zelena throws him a knife twist by calling him “dearie” before disappearing. Later we see that Zelena’s envy toward Regina is what eventually turned her green, which is a little on-the-nose, but remains strangely satisfying. Zelena’s backstory certainly helps help flesh out her current persona, which basically is just around this episode for her big showdown with Regina. This heralded event is frankly kind of short after all that buildup, basically consisting of her throwing Regina around a few times like a hacky-sack (right through the ever-present clock tower!). Because Regina didn’t bring to the fight what Zelena really wanted: her heart. In a scene much too meta, Regina gives Robin Hood her heart to watch over and then asks him to keep taking care of it and yes, we get that he has her heart. But her smile at his request for a drink at the end of the scene was pretty cute. Zelena has Charming’s courage, wants Regina’s heart (ah, Storybrooke, where people can just walk around without their hearts), and good luck finding some brains to pick in Storybrooke. These elements will hopefully help her pull off a curse that involves time travel, so that she can take her birthright back and Regina will never have been born. I think that’s the plan, I admit to often getting confused in the midst of OUAT machinations. When Zelena said we were going to do this all over again I actually groaned, but then Walsh was revealed, leaving me with enough faith to see what this plot will pull off. Because this stupidly titled episode offers the most hope yet for this OUAT season. Emma entrusts Henry to Hook this episode, as they try to bond over nautical navigation and the fact that Henry’s father Bae was once on Hook’s ship. (this is after Hook has offered to talk to him, and Emma counters, “About what? Leather conditioner and eyeliner?”). 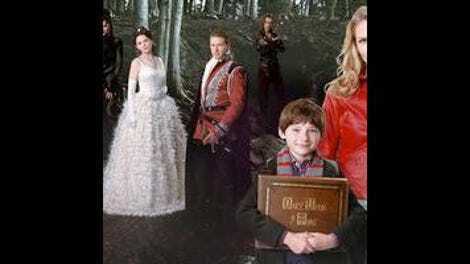 But even Henry is slowly clueing in to how everything is not as it seems in Storybrooke (“Aren’t you guys around the same age?”). The sympathetic shots of Hook’s possibly softer side lose a little luster when you think that he’s probably just trying to manipulate the whole situation to get close to Emma, in the same episode that sends Neal six feet under. Too soon! Clueless Snow #1: “Are you sure Cora didn’t booby-trap all her stuff? I mean, I don’t think a sleeping curse would be good for the baby.” But hanging out with unknown midwives is? Clueless Snow #2: “We’re already in Storybrooke; we’ve already lost our memories; what else could she do to us?” She could kill you all, set fire to the town, steal your baby, any number of things, actually. How can the Storybrookers possibly defeat this impressive sorceress with their most powerful magical being (Rumple) under her command? Have to appreciate Zelena knocking down Emma after her “savior” comment, and the reappearance of the shaving razor as a possible murder weapon. Tink lives! But is sad Regina doesn’t want to gossip about boys with her.